(Membran) 78 Titel (New recordings) with 28-page booklet. German Schlager Star! 05 Sag ihr, dass sie schöner ist (Try A Little..
One of the most popular German hit stars of the 50s to 70s died on April 13, 2007 after a long and serious illness - Peter Beil. Born in Hamburg on July 9, 1937, he discovered his preference for trumpet playing as a member of a trombone choir at an early age. Beil enrolled for this instrument at the Musikhochschule, gave up jobs in a textile company and as an airport employee. With the Crazy Combo he caused a regional sensation as an amateur musician, and the versatile artist was discovered in Peter Frankenfeld's TV show'Toi Toi Toi'. Immediately afterwards Beil got a contract as a singer with Philips, other records were released - unusual for the time - on Amiga in the GDR. In 1961 Peter Beil made his big breakthrough with Corinna Corinna, the German version of the Ray Peterson hit. Also with titles like Carolin, Carolina and Dein Zug fährt durch die Nacht and Kleine Nervensäge Monika he could place himself in the German charts. Until 1970 he brought another seven songs to the hitlists. Also under the pseudonym Ricky Boys - here he sang a duet with himself - Beil scored a goal: Hello, Mary-Lou. Later Franco Duval became his partner. Beil was also active as an actor, for example in the music and entertainment film'Tanze mit mir in den Morgen' alongside Gerhard Wendland, Carmela Corren, Udo Jürgens and Rex Gildo. The highly qualified Hamburg native appeared in over 300 television shows, and at the end of the 1970s he took over musical direction when the'ZDF Hitparade' went on a major tour. 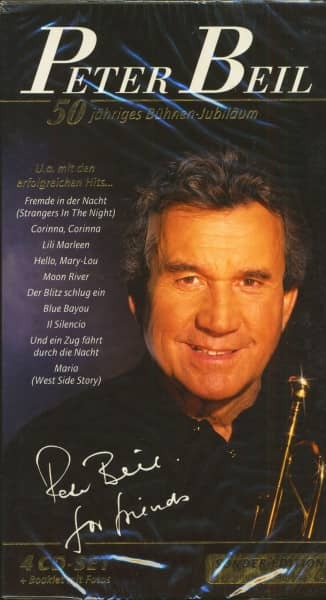 He appeared in the programme itself, entitled Der Blitz schlägt ein, and in 1984 he worked as First Trumpeter for Hazy Osterwald in his orchestra. Peter Beil continued his own show programs of 60 (solo: vocals, trumpet) and 150 minutes (with a trio:'hits, swing and jazz'). 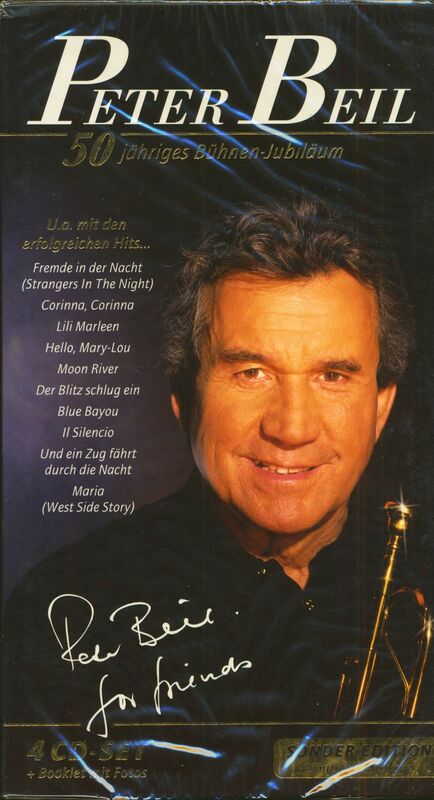 In August 2005 he played Il Silenzio at the grave of the late Ilse Werner in Potsdam. The musician, who is popular with fans and colleagues alike, has a permanent place in the annals of the German hit and will remain unforgotten as a sought-after instrumentalist. 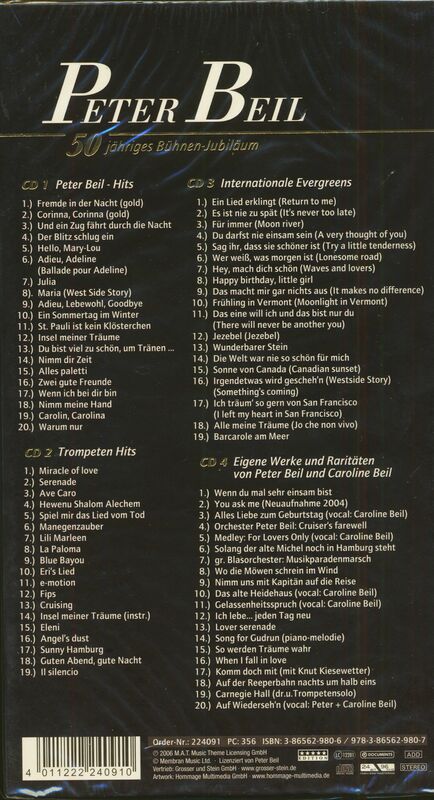 Customer evaluation for "50jähriges Bühnen-Jubiläum (4-CD) Limited"
Eine klasse Produktion mit ganz viel toller Musik zu einem super Preis. Kann ich nur empfehlen. Ein Muss für alle Peter Beil-Fans.